When Summer’s behavior manage to alienate everyone, even Moony, she’s forced to decide if a life so difficult is worth living. 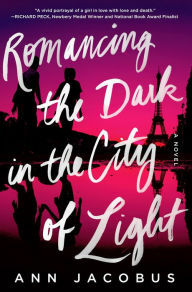 With an ending that’ll surprise even the most seasoned reader, Ann Jacobus’ Romancing the Dark in the City of Light is an unputdownable and utterly compelling novel. From Me: I read this novel as an ARC from NetGalley. I wasn’t sure what to expect from this novel when I began reading it. I always say that I read for pleasure and not to feel sad or depressed. The blurb, “she’s forced to decide if a life so difficult is worth living” almost made me turn away from this book. Reading an angsty, teenagery-type book isn’t my idea of a good time. I’m happy that I didn’t judge this book by its cover. Summer is struggling through her second attempt at her senior year of high school. Not only is school hard, but she’s virtually alone in a foreign city. Her attempt to make life more liveable is to find a boyfriend. What is more romantic than holding hands with someone special in Paris? She meets Moony, another senior at her new school, who doesn’t shy away from Summer’s sometimes harsh, in your face, attitude. Recognizing and appreciating this in him, Summer immediately begins falling for Moony. Summer also meets Kurt. He is the best looking guy she’s ever had pay her any attention and she, again, feels an instant attraction. However, there’s something off about Kurt that Summer can’t quite put her finger on that makes her wary, not wary enough to stay away though. Summer goes back and forth between these two very different men who each feed something in Summer that is missing. I had a hard time putting this book down. I was pulled into Summer’s story and this book was full of the feels. I cried through a lot of it, and despite what I said earlier, that was okay. Some of the story was predictable, but I thought Jacobus also had a lot of clever twists and metaphors throughout the book. Not too shabby if I do say so myself. 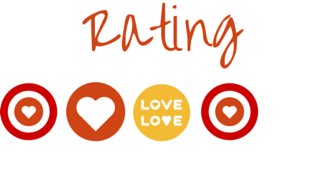 Including item #12, my read books for October had an average rating of 3.46 Hearts. Not including item #12 they had an average rating of 3.75 Hearts. Again, not too shabby. My favorite book of the month is Fangirl by Rainbow Rowell. I think it’s safe to say that I’m a fan of Rainbow Rowell. I just have one more book of hers to read before I’ll have read them all. She needs to write faster. Do you have any favorite writers that you feel that way about them? That they need to write and publish faster? My least enjoyed book of the month was We Were Liars by E. Lockhart. I enjoyed her writing style but not the story. In case you were wondering, I don’t include Frozen because the reason I didn’t read it was because the formatting for the eBook was frightful. It also needed some major editing. I mean, names and the beginning of sentences weren’t capitalized. I couldn’t read it like that. It was an ARC, so nothing was really lost on my part. 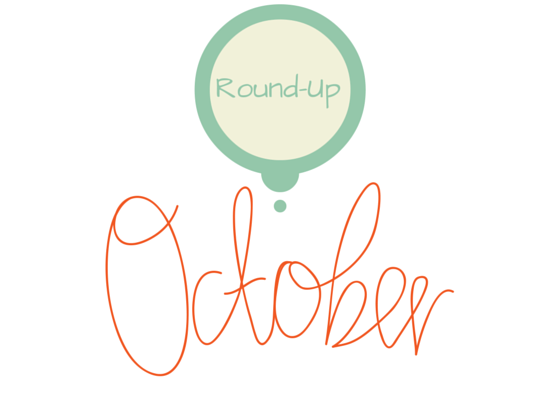 How was your October reading? How did it compare to September? E-Books: Trendy Fad or Taking Over the Universe? I read an article yesterday that discussed how the sales for tablet devices are down. Is there supposed to be a correlation between this statistic and eBook sales? Considering that I read this article on Digital Book World, I think that might’ve been their point. Then, I read an article published on the Library Journal’s website about how some college book stores have stopped selling books. I guess this means they need a name change, huh? Are eBooks taking over the world? Is this the beginning of the end for print books? This is a subject that has been debated for quite some time now. As a library and information science student, debating eBooks versus print books and the death of libraries comes up…A LOT. I even recently saw an article (I don’t remember where off the top of my head) that said something about how the trend of reading for pleasure is making a comeback. Making it sound like being literate is a fad. Hello!! First of all, I think it’s complete ignorance to think that the evolution of books and how they’re distributed means the end of libraries. Circulating print books is a fraction of the services that a library provides. A library is an institution for preservation. It’s much, much more than just books. Secondly, the advent of written communication began on the walls of caves and on papyrus scrolls. eBooks are just yet one more way of getting literature out there. As for print books, maybe, just maybe, there will be a decrease, eventually, in the amount of editions of a book that are printed. Someday. But I don’t think printed books will ever go completely the way of the dinosaur. Why? Because there is something about the beauty of a magnificent cover of a book that doesn’t come through on the digital version. There is the feel of a book cover. Some are like velvet, some are textured, some are embossed, some are shimmery, some are matte, some are metallic. None of that comes through in an eBook. Sometimes, the edges of the pages of a book are unique. Some are painted black, or red, or gold. Some have the deckle edging. Some pages are smooth while others are rough. I always run my hand down the page of a new book to see what kind of paper it was printed on. Then you have truly unique books like Horrorstor which was printed to look exactly like an Ikea catalog. If you haven’t seen the absolute beauty of this book for yourself, in person, I highly suggest that you make a trip to your nearest bookstore. Holding that book is an experience in and of itself. You simply cannot get these tangible, sensory experiences with eBooks. 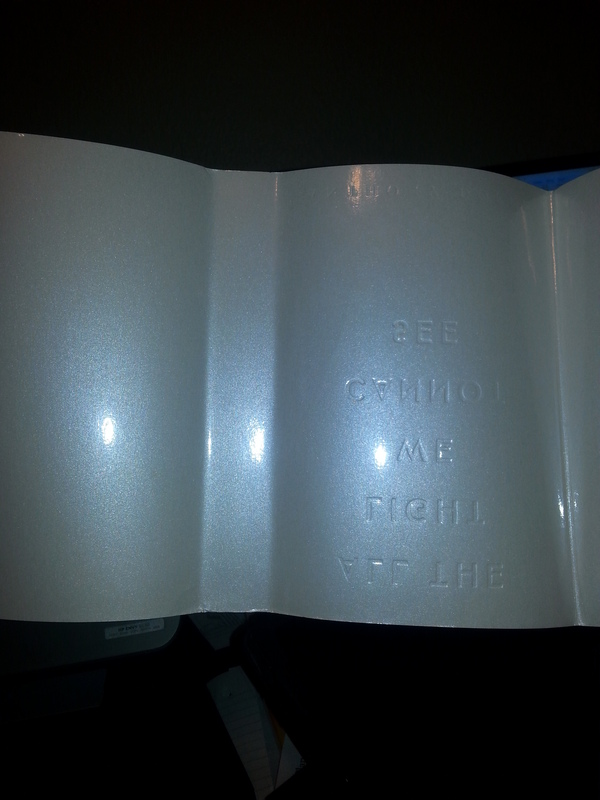 Horrible image, but this is the inside of the dust jacket on Anthony Doerr’s All the Light We Cannot See. Can you see how it shimmers? This is a perfect example of why printed books are better than eBooks. eBooks serve a purpose and I have hundreds downloaded on my various apps. They’re convenient, They travel very well. If you have a tablet device like an iPad, you can read them in multiple formats all on one device and then use that device for various other apps. They store much nicer. If you have a “lendable” version of a book, they’re much easier to lend to a friend and you don’t have to worry about never getting them back. Some come as enhanced versions like my Kindle version of Lauren Oliver’s Pandemonium that comes with X-Ray (whatever that is) videos, text to speech, and other stuff. I haven’t read this yet, so I haven’t explored all the extras. How cool is that though? All that being said, until they figure out how to digitally reproduce the smell, look, and feel of a real book and the experience of aimlessly meandering around my favorite bookstore just so that I can be there amongst books, for me, there will never be anything like the real experience of holding a beautifully printed book in my hand.